New York – Hedley Productions is happy to announce its success in introducing cryptocurrency to the film industry through its VCAP crowdfunding campaign. The VCAP campaign has so far raised the minimum required amount to start the pre-production and casting process for its upcoming feature film, Listen Carefully. With Hedley Productions continuing to raise the required amount through ongoing VCAP crowdfunding as well as new film and tech investors, the shooting has been moved to March 2017 from the later part of this year. To show transparency and accountability, the VCAP community was consulted before changing the shooting dates and agreed upon this change. The initiative to create awareness about the use of cryptocurrency in filmmaking though Vulture Capital has been a new experience for all those involved. Vulture Capital has already gained a community of loyal followers who it believes will be instrumental in promoting, supporting and investing in VCAPs toward the Listen Carefully project. Hedley Productions intends to maintain maximum engagement with VCAP holders and other investors to ensure that they are constantly updated about and approve of any new developments. Said Ben Padua, Producer at Hedley Productions. While Vulture Capital initially focused their investment efforts on the cryptocurrency community, they slowly began to garner the attention of the film industry where the first indicator of VCAPs success has been in the intersökest of industry professionals, who readily agreed to work on Listen Carefully out of sheer enthusiasm. Said Shira Zimbeck, Writer and Artistic Director at Hedley Productions. 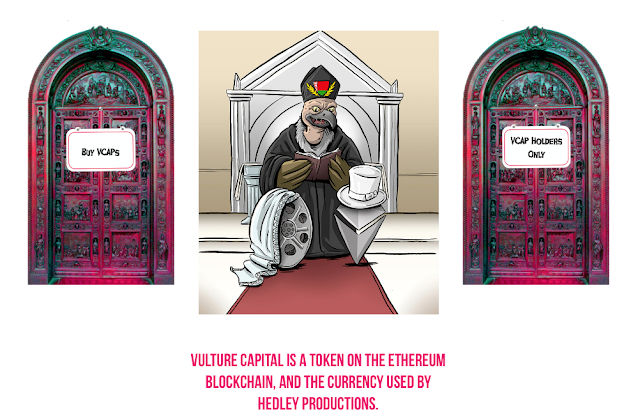 To support the emerging Hedley community, Vulture Capital has merged its website with that of the production company, along with a dedicated members area to offer VCAP token holders an insight into the potential uses of VCAP. In the member’s area, VCAP holders can gain exclusive access to live feed and updates from Listen Carefully’s sets, Hedley Production content and news updates. With VCAP gaining more traction, interested investors can still make use of the ongoing crowdfunding campaign to invest in Listen Carefully and be part of the VCAP community.